← Holladay, Utah. January 19th, 2013. A water main break on Tyvola Centre Drive Monday morning caused a giant sinkhole that swallowed a car, sidewalk and even a tree. It was the last thing Brian Yurkovic thought would happen when he went to take out the trash. “I was coming down the road, and I hit a big bump,” said Yukovic. That bump turned out to be a sinkhole that caved the moment his car passed over it. Eyewitness News learned it was caused by a water main break. It emptied the ground above it and not only took out the streetlight but also the sidewalk, a tree, the surrounding grass and half of the road. Yurkovic was left with two flat tires. He said that’s when he got out of his car to warn others. “I turned around, started waving to slow her down, and right into the hole she went,” he said. The driver’s red Hyundai got stuck half on the road and half in the hole. 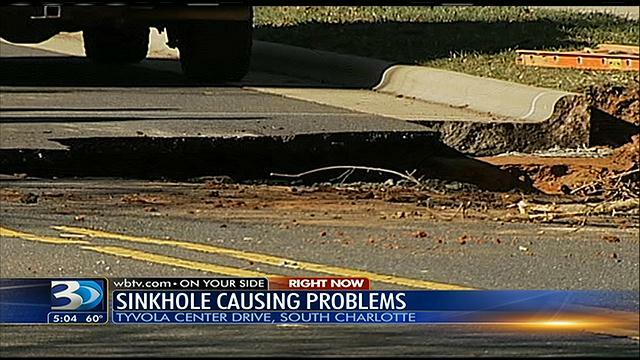 The Charlotte Mecklenburg Utilities Department was called to fix it but couldn’t until both cars were towed. It took the wrecker about an hour to load both cars and lift the Hyundai out of the hole. In the meantime, CMUD shut off the water to the entire area, including the nearby apartment complex. It made some people so late for work, they had to call out. “I think we’ll have to take a vacation day today,” said Aruba Paul. None of the drivers were hurt. Residents were told it would take four to six hours to fix. CMUD says water main breaks happen every day. Eyewitness News has reported about the city’s aging water main structure for years. With more than 4,000 miles of pipe, the city says it’d be too costly to replace. Its policy is to fix them as they break. This entry was posted in Pictures, Vehicle v Sinkhole. Bookmark the permalink.